In this chapter, the model is evaluated and examined that was proposed in the previous chapter. Sticking to the model might be boring to mechanical engineers and robotics researchers, this process is especially important for solving activeness problem. Because of its simplicity, the model is sensitive to the difference of parameters. The system is extended from material to machine in the next part, design. Before that, it is essential to make clear compensation method and level of unreliability. Aside from the activeness problem, there is a fundamental problem for modelling. Most of the polymer scientists believe that the model should not be so much simple, because gel is a complex system. Some researchers noted that the model might be reasonable because it went well with experimental results. The descriptive power of the model is made clear as a result in the course of this book. We believe that the model is acceptable for polymer scientists at certain approximation level. In this chapter, the condition is kept simple. 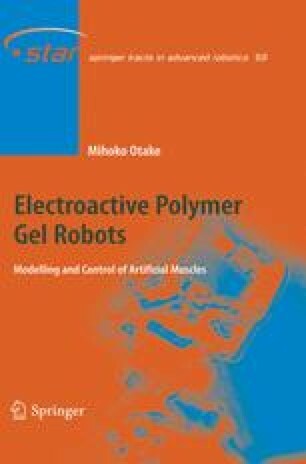 Deformation response of the gel to spatially uniform static electric field is investigated. This strategy was selected to remove the effect of other factors like modelling error of electric field or meshing of the gel.